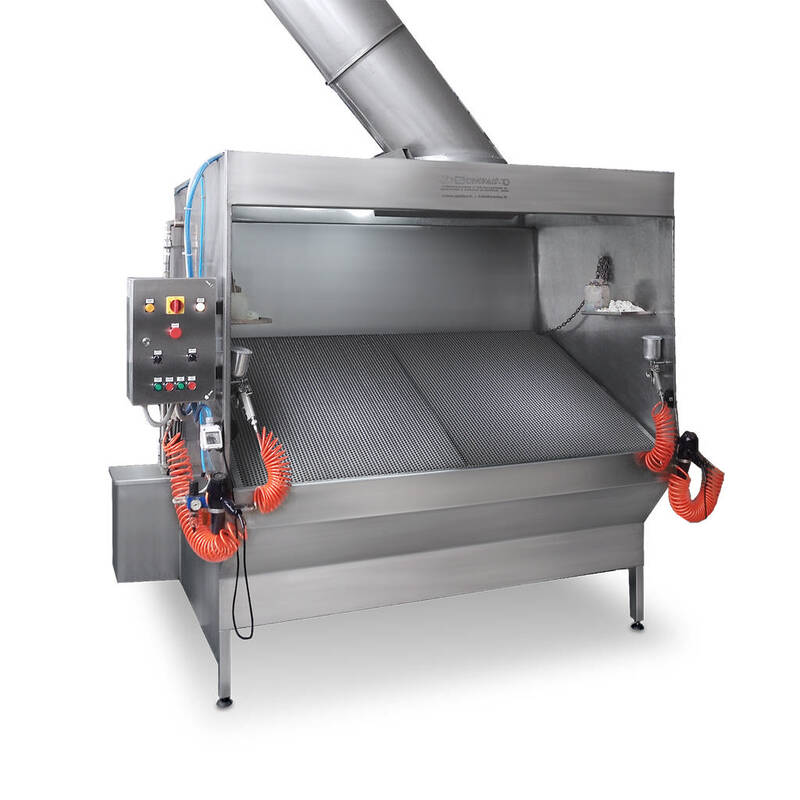 The Adherent Water manual spray booth is mainly used for leather finishing samples or also in other sectors where it is necessary to spray products that should not be inhaled by the operator. We have decided to build it only and exclusively in stainless steel to minimize ordinary maintenance. To facilitate the latter, we have divided its structure into three completely dismountable sectors (adherent water – upper part – tank). Since the adherent water is the part where the most product is accumulated, and it has to be cleaned from time to time, it is more easily accessible since it is placed right behind it and it is removable. The booth has a standard Automation System that allows the switching on and off, timed according to use, of the adherent water pump and electric fan: this allows to reduce the costs of electricity and improve the working environment by eliminating the noise produced by the electric fan when electricity is not used. The inclination of the spraying plane can be adjusted according to the needs of the operator by means of chains in the Basic version or by means of air pistons in the Plus version. The electro pump compartment that drives the adherent water film is placed externally on one side of the both, so it is easily accessible for maintenance. A valid alternative to the adherent water-based system can be dry filtering, but the choice depends on the customer’s needs. The booth can be fitted with a coat rack to spray the finished product such as jackets, coats or shoes. 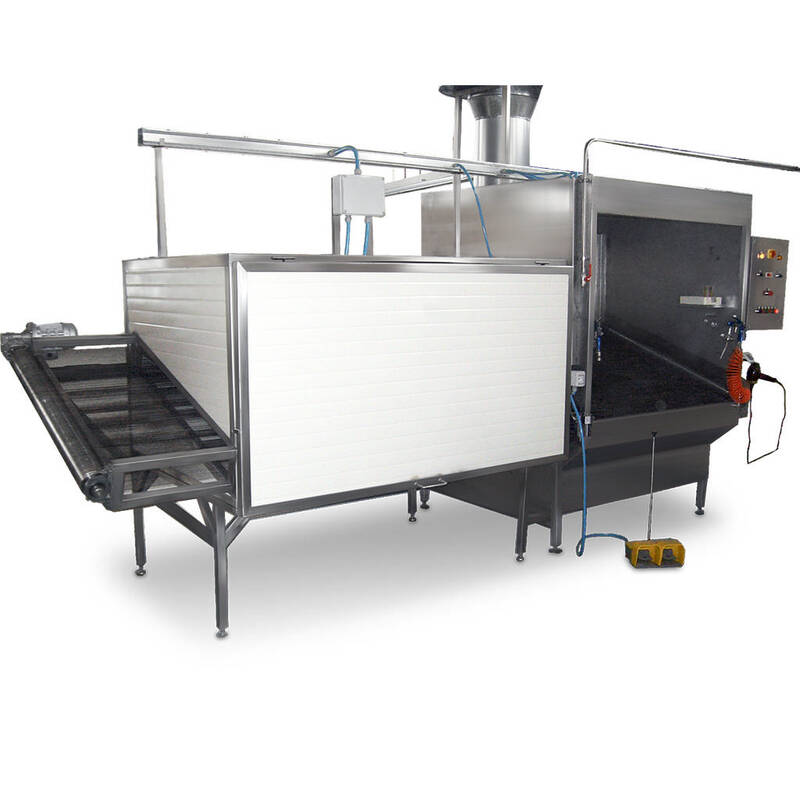 In the Velox VAA ASX version there is a drying oven that is built with panels of coagulated metal sheet pre-painted with epoxy paints. The leather is carried into the oven through a Nylon carpet controlled by the operator through a special pedal. It can also be built as a free installing. The heating system can be realized with radiators working with steam, hot water, superheated water, ceramic heating elements.